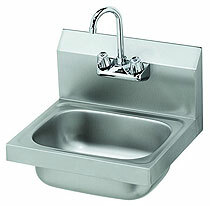 The Royal Stainless Steel Hand Sink With Gooseneck is 15.75"W x 15" overall and is wall mounted with bracket. Bowl is 12-3/4" x 10" x 6" deep compartment and includes a splash mount gooseneck faucet and 1-1/2" drain. Stainless steel construction. Mounting bracket included. NSF approved. Click image for measurement diagram.